The Oriental cockroach (also known as: waterbug and Blatta orientalis) is a large species of cockroach, measuring about 1 inch in length at maturity. It is dark brown to black in color and has a glossy body. The female Oriental cockroach has a somewhat different appearance to the male, appearing to be wingless at casual glance but has two very short and useless wings just below her head. She has a wider body than the male. The male has long wings, which cover a majority of his body and are brown in color, and has a more narrow body. The odd male is capable of very short flights, ranging about 2 to 3 feet. The female oriental cockroach looks somewhat similar to the Florida woods cockroach, and may be mistaken for it. In order to thrive, cockroaches need a place to hide. They prefer warm places and a relatively high humidity if possible; they also need a source of food/liquid. The optimum temperature for oriental cockroaches is between 68 °F to 84 °F. Female oriental cockroaches have vestigial tegmina (reduced forewings) and males have longer tegmina. Cockroaches are mainly nocturnal. 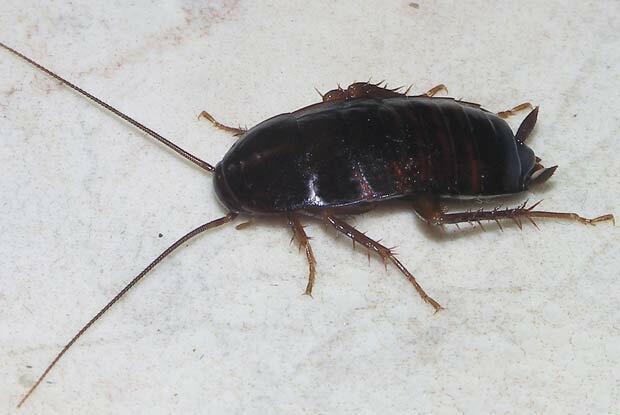 Oriental cockroaches can be elusive in that a casual inspection of an infested dwelling during the day may show no signs of roach activity. Give us a call today at 503.720.8559 to learn more about Oriental Cockroaches or to schedule an inspection!